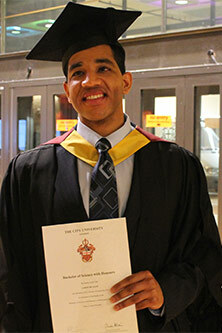 Talented musician overcomes visual impairment challenges to graduate with high honours. In spite of glaucoma which severely restricted the vision in his right eye, Aaron De-Allie joined over 1800 students who graduated from City University London recently, at a series of ceremonies held in the capital. "City provided me with note takers to assist with lectures and gave me tremendous library support in finding books, ordering additional lighting and helping me to scan and photocopy study materials." "Shortly before starting my degree programme at City, I underwent surgery to reduce the pressure in my right eye, due to glaucoma. Unfortunately, a cataract appeared in that eye and threatened my ability to read anything clearly and easily. Initially, I questioned if I should remain on the course or try to switch to a different course. I definitely had to manage my fears about the further deterioration of my vision on a daily basis." Aaron's disability, however, did not prevent him from having a balanced life at City. He combined his love of playing classical and jazz piano with being a Student Ambassador in his final year. "I chose City because of its connections with the world of business and the City of London, in addition to a strong sense of a supportive network, which I felt when I visited the University for the first time and met with the admissions tutor and other academics within the School of Engineering and Mathematical Sciences. I have always been passionate about mathematics because of its applications to the real world, especially for making decisions in business and in scientific research. Ultimately, I would like to work in investment management."